So no calf so far this year. We are impatiently waiting for Sybil to give birth. It is cooling off at night and will soon be cold at night, she needs to have that little one so it will be large enough to make it. 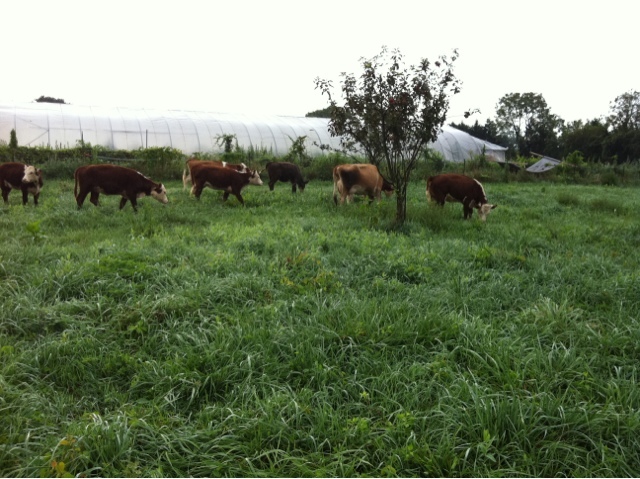 The herd is on the far side of the hoop house today. They will clean up around the fruit trees. If you look closely you can tell which one is Sybil. A Jersey girl, she is light brown with black and white markings. Earlier this year when we stopped taking milk, her milk bag shrunk down to almost nothing. In this picture her bag is visible at a distance, and is full up. Another sign that a calf is likely to be on the way soon, as she will need a full bag to feed a hungry calf.